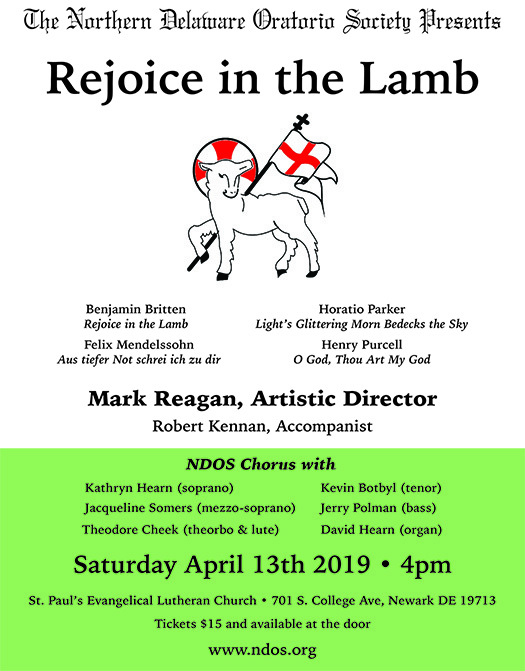 The NDOS Spring 2019 concert “Rejoice in the Lamb” will be on Saturday April 13th, 4pm, at St Paul’s Evangelical Lutheran Church, 701 S. College Way, Newark DE 19713. Interested in joining NDOS? See our Members page for more details and use our Contact form if you have any questions. We are a friendly and welcoming non-audition chorus that sings classical choral repertoire - feel free to join us! Rehearsals are on Sundays 2:30pm - 4:30pm at St James Parish Hall (2106 St. James Church Rd, Wilmington DE 19808) and will start Sunday January 20th, 2019. Our second concert of the 2018/2019 season, Rejoice in the Lamb, will be held on Saturday April 13th 2019 at 4pm at St Paul’s Evangelical Lutheran Church, 701 S. College Ave, Newark DE. In addition to Benjamin Britten’s cantata Rejoice in the Lamb, the NDOS chorus will also perform Henry Purcell’s O God, Thou Art My God, Horatio Parker’s Light Glittering Morn Bedecks the Sky and Felix Mendelssohn’s Aus tiefer Not schrei ich zu dir. NDOS will be joined by soloists Kathryn Hearn (soprano), Jacqueline Somers (mezzo-soprano), Kevin Botbyl (tenor) and Jerry Polman (bass) as well as Theodore Cheek (theorbo and lute) and David Hearn (organ). This fall we commemorate the 100th anniversary of the ending of World War I with our concert: Remembering the Great War in England’s Poetry and Song. 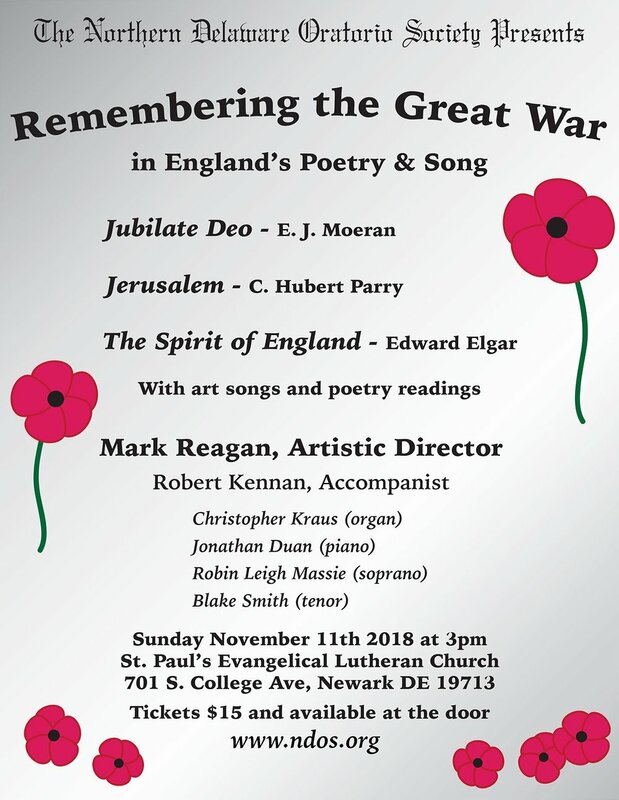 The concert is centered around Edward Elgar’s The Spirit of England - composed during WWI and setting text of three 1914 poems: The Fourth of August; To Women; To the Fallen. In addition to the choral works, there will be art songs, instrumental interludes and poetry from the period. The NDOS chorus will be joined by Robin Leigh Massie (soprano), Blake Smith (tenor), Christopher Kraus (organ), Robert Kennan (piano) and Jonathan Duan (piano). November 11 at 3pm. St. Paul's Evangelical Lutheran Church, 701 S. College Ave, Newark DE 19713. Tickets $15 and available at the door.